Sport bikes are motorcycles that have been optimized for speed and performance. Unlike traditional motorcycles, such as cruisers, sport bikes are classified as high-powered motorcycles specifically designed for seamless maneuverability and increased acceleration. Because of the extreme speeds sport bikes can achieve, the dangers of sport bike accidents often exceed those of crashes involving traditional motorcycles. If you or a loved one has been involved in a sport bike accident, the attorneys at 911 Biker Law can fight on your behalf to get you the just compensation deserved. Here are some of the types of accidents and resulting injuries for which we represent clients. The Orlando motorcycle accident attorneys with 911 Biker Law understand how a sport bike accident can cause considerable mental, physical, and financial duress. This is why we defend your rights and fight for full compensation from the insurance company for your injuries. A 2016 report detailed that 5,286 bikers were killed and 88,000 bikers were injured in motor vehicle traffic crashes in 2016. Sport bikes, which are popular in Florida, are one of the most common type of motorcycle involved in motorcycle accidents for several reasons. The Orlando area sees heavy traffic and is home to poorly maintained roads, potholes, debris, construction barriers, and other obstacles. For cars and many other types of motor vehicles, these are typically minor inconveniences. But for lightweight sport bikes traveling at incredible speeds, road hazards are likely to cause accidents, some of which can be fatal. Riding a sport bike can be exhilarating but it’s also extremely dangerous. Sport bikes are small visual targets obscured from view behind buildings, street signs, and other motor vehicles. When motorists fail to check for sport bikes and other types of motorcycles while driving, it’s likely that an accident will occur. Sport bikes are made from lightweight materials that facilitate their accelerated speeds. If the motorcycle’s tires wobble or shake while moving at a high speed, the bike may be misaligned and/or defective. If this causes an accident, the sport bike manufacturer can be held liable for any injuries that result. Orlando motorcycle accident lawyers with 911 Biker Law have worked closely with sport bike riders and their loved ones following a sport bike accident. We work to build a strong case and seek full compensation for your injuries. Whether you’ve owned a sport bike for years or this is your first one, every sport bike rider can benefit from these sport bike safe riding tips from 911 Biker Law. A sport bike helmet is one added layer of protection between you and the dangers of the road. Any type of motorcycle helmet typically features a rigid outer shell, impact-absorbing liner, special padding, and a secure chin strap. Although Florida’s helmet law does not require every sport bike rider to wear protective headgear, wearing a helmet is essential for reducing your risk of experiencing traumatic brain injury, increasing your visibility to other drivers, and avoiding dangerous road debris, such as rocks or pieces of lumber, that could impair your vision. Oftentimes, drivers forget to physically inspect their blind spots before making lane changes. This is why it’s important to exercise extreme caution around other drivers by riding responsibly and avoid weaving in and out of lanes. In addition, riders should try to avoid driving in the blind spots of other vehicles. When Should You Hire A Motorcycle Accident Attorney? 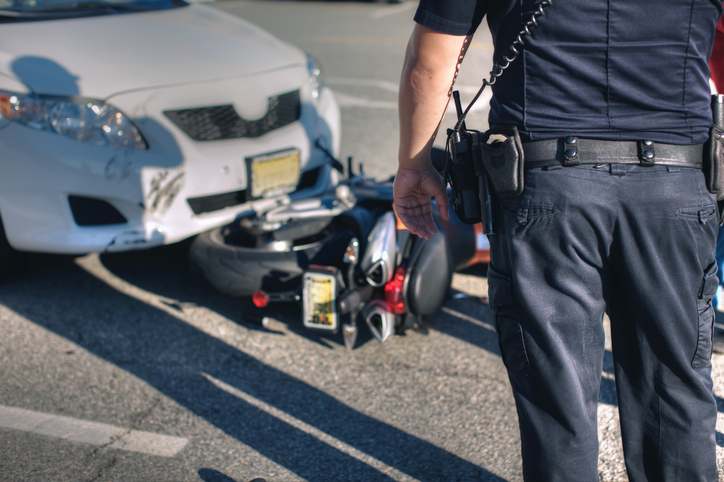 The time to call the Orlando motorcycle accident lawyers with 911 Biker Law is as soon as possible following a sport bike accident involving you or a loved one. You’ll speak with an experienced attorney who not only understands the toll these accidents have but will also advise you on handling the police and insurance companies. We work with you to build the strongest case possible for you to receive the maximum total compensation deserved. After an accident, your should focus on recovery, not insurance claims. Contact a motorcycle accident attorney today.